It is hard to ignore politics right now. the threats of nuclear war and environmental catastrophe face us with alarming plausibility. the inequalities that forced people before us to stand up and fight back are making an ugly comeback. We see the racism of the criminal justice system, the segregated education system, and of course, the destruction of new Orleans. We see the scapegoating of immigrants, the demonization of Arabs and muslims. We see the rise of sexism and homophobia, the wholesale attacks on a women’s right to choose, and pensions being cut as health care costs skyrocket. While this suffering continues for the masses, the wealthiest in society experience record breaking profits and have ever expanding influence over the quality of life for the rest of the planet. Politics are part of the landscape that we live in. Everything is for sale. even free art gets evaluated in the context of a world of price tags. but we need to make art, right? To kick off this series we are going to talk about the function art plays in society and how power has influenced this role historically and continues to effect artist’s today. Ultimately we’ll ask the questions, “What is going on in the world?” and, “can artists be a meaningful part of resistance”? San Francisco-based artist Amy Balkin’s art practice combines cross- disciplinary research and social critique, focusing on how humans create, interact, and impact the social and material landscapes they inhabit. Her most recent project is Invisible-5, a collaborative critical audio tour of the i-5 corridor between the bay Area and los Angeles. Other projects include This Is the Public Domain (thisisthepublicdomain.org), an attempt to create a permanent international commons from 2.5 acres of land located near tehachapi, CA, via legal transfer to the global public, and Public Smog (publicsmog.org), which examines the commodification of the atmosphere through the economic mechanism of carbon trading. She received her MFA from Stanford University in 2003. Snehal Shingavi is a PhD candidate in english literature at UC berkeley. His dissertation “the mahatma, the marxists, and the modernists” explores indian writing in english from the 1930s and 1940s. He is the author of several articles on Palestinian history, literature, and politics, and has recently published a translation of munshi Premchand’s novel, Sevasadan (1917). Shingavi is a regularly invited speaker on topics that address the intersection of artistic and political movements, and is currently a docent at the Berkeley Art Museum for the Edge of Desire: Contemporary Art from South Asia exhibition. Artists are both producers of commodities and cultural artifacts—how does one effect the other? What strategies have artists employed to make art that satisfies their need to bite the hand that feeds them? Political art can become chic, but does it remain sharp? How does the art market shape art? these tensions have been observed and experienced for centuries, but they continue to exist and evolve—we want to promote a discussion about the current incarnations and strategies that artists employ to navigate this terrain. Will Bradley is a visiting Professor at the California College of Art in San Francisco. He co-founded the modern institute in glasgow and writes for Frieze, Afterall, and Metropolis. He has curated many exhibitions including My Head is on Fire but my Heart is Full of Love at charlottenborg, copenhagen, and Pyramids of Mars at the barbican, london. bradley is currently working on an anthology of essays and artists’ writings, Art and Social Change—1871 to the Present, for Afterall books, and editing a book entitled Self Organisation/Counter-Economic Strategies in collaboration with the Danish artist group Superflex. He has curated two exhibitions for the Wattis institute for contemporary Art in San Francisco, Radical Software and How to Build a Universe That Doesn’t Fall Apart Two Days Later, which opens in november 2006. Jordan Kantor is an artist and Associate Professor at california college of the Arts, where he teaches both art practice and theory. He has written extensively on contemporary art, and is a frequent contributor to Artforum. We are separated from the things we make. We are separated from the people who make the things we use. We are asked not to look at the world directly. We think this situation is untenable. We must confront reality and not deny the destruction and alienation that surrounds us. ken WOrtHy is interested in the larger questions concerning the global environmental crisis: is there anything more fundamental than economics or population? Why are modern modes of human/environment relation destructive on such a large scale? What particular historical, philosophical, and ethical factors contribute to the current crisis? in pursuit of such questions, Worthy has developed a theoretical framework based on the concept of dissociation, that helps to reveal the ways in which the material disconnections of modern life—of people from nature, from the processes of production that they rely upon, and from other people in the larger community—work to proliferate environmental and social harms. Dissociations, he asserts, undermine personal ethics and community politics. His interdisciplinary research in philosophy, anthropology, and psychology sheds light on the conceptual roots of material dissociations. ken received a PhD in critical environmental theory at Uc berkeley in 2005. rigO23’s most recent projects include the fifth installation of the nomadic institution, Tate Wikikuwa Museum, at the Aldrich museum of contemporary Art, ct, through February 2007; the caging of the four stone lions guarding the entrance to St. george’s Hall in the liverpool biennial 2006; and in 2005 the dedication of a twice life-size sculpture of tommie Smith and John carlos at San José State University campus. Harrell Fletcher has worked collaboratively and individually on a variety of socially engaged interdisciplinary projects for over a decade. His work has been shown in the bay Area at SFmOmA, the de young museum, berkeley Art museum, and yerba buena center for the Arts; in new york at the Drawing center, Socrates Sculpture Park, the Sculpture center, the Wrong gallery, and Smackmellon; Signal, malmo, Sweden; Domain de kerguehennec, France; and the royal college of Art, london. Fletcher is represented by Jack Hanley gallery, SF/lA; christine burgin gallery, ny; laura bartlett gallery, london; and galerie in Situ, Paris. He was a participant in the 2004 Whitney biennial. in 2002 Fletcher began Learning To Love You More, a participatory web project with miranda July. He is the 2005 recipient of the Alpert Award in visual Arts. His current exhibition The American War originated in 2005 at ArtPace in San Antonio, TX, and is currently traveling throughout the US. Fletcher is a Professor of Art at Portland State University. Brecht said that art is not a mirror to reflect the world but a hammer to shape it. How effective is this hammer? Should artists use their art as a propaganda vehicle? How can this work? Are artists obligated to make politically engaged work given the current situation in the world? Aaron Gach is a performance, installation, and media artist whose work consistently addresses public space, social politics, and community issues. His commitment to exploring disparate arts (martial arts, magical arts, fine arts, among other creative endeavors) has led to the creation of numerous collaborative projects designed to analyze existing forces and activate latent energies. inspired by ongoing studies with a private investigator, a magician, and a ninja, gach formed the center for tactical magic—an organization dedicated to the coalescence of art, technology, magic, and positive social transformation. embracing magical thinking and unconventional uses of technology, gach and the center for tactical magic continue to engage public space and social concerns while building new strategies for creative engagement. Elizabeth Mangini is a San Francisco-based scholar and critic whose current work focuses on italian art and politics circa 1968. A former curatorial fellow at both the Walker Art center, minneapolis, and the museum of modern Art, new york, mangini currently teaches a course on “Spectacle and revolution: european Art in the 1960s–70s” at California College of the Arts. 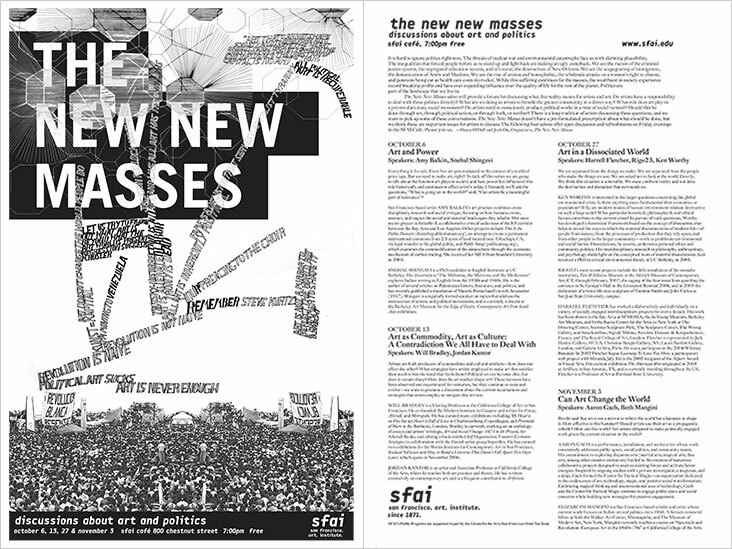 SFAI’s Public Programs are supported in part by the Grants for the Arts/San Francisco Hotel Tax fund.sfai San Francisco Art Institute since 1871.